If you’re here, then you’ve gotten a speeding ticket somewhere in Metro Atlanta. You’ve got questions, like how can I beat my speeding ticket? How will my speeding ticket affect my license? How will my speeding ticket affect my insurance rates? Take a deep breath. You’ve come to the right place. The smartest, and easiest, way to ensure you’re going to beat your speeding ticket is to hire an experienced traffic ticket attorney. Speeding tickets are a fact of life in Atlanta. Atlanta residents have very few public transportation options. This means a lot of driving, and a lot of speeding tickets, everyday. The way things are set up in Atlanta, drivers almost can’t help but get speeding tickets. Low, restrictive speed limits catch drivers off guard and lead to speeding tickets because the police know exactly where to wait and use laser and radar to issue speeding tickets at a fast rate. The police know the very best spots to wait for unsuspecting drivers. Police wait at the bottom of hills to issue speeding tickets to drivers. Police lurk in construction and school zones to issue speeding tickets to drivers. In metro Atlanta, a growing number of municipalities are using speeding tickets as a reliable source of revenue for their city. All of these factors are leading to a growing number of speeding tickets being issued in Georgia everyday. Speeding ticket attorney Sean Goldstein fights for the rights of drivers who have been given speeding tickets in metro Atlanta, Gwinnett County, and Dekalb County, and all of the municipal courts therein. If you’ve gotten a speeding ticket in Atlanta, or anywhere in the State of Georgia including Gwinnett County, Dekalb County, Fulton County, Cobb County, or Douglas County, or in the cities of Atlanta, Alpharetta, Brookhaven, Chamblee, Doraville, Douglasville, Dunwoody, Duluth, Johns Creek, Lawrenceville, Marietta, Norcross, Roswell, Sandy Springs, or Suwanee, call us at (678) 757-5529 for a free consultation. Atlanta speeding ticket lawyer Sean Goldstein saves drivers with speeding tickets time. Representation for your speeding ticket can be secured in a single phone call. Most of the time, our speeding ticket attorneys can appear for you in traffic court. Can’t take time off of work to go sit in traffic court to deal with your speeding ticket? Is your personal and family life too hectic to spend hours on a speeding ticket? Call speeding ticket attorney Sean Goldstein now and you may not have to attend traffic court at all. If you plead guilty or nolo contendere to a speeding ticket, it can cause a dramatic rise in your car insurance rates. If you plead guilty or nolo contendere to your speeding ticket, the speeding ticket will go on your Georgia Motor Vehicle Report (MVR). Once the speeding ticket reports to your MVR, your car insurance company will see the ticket and correspondingly raise your car insurance rates for anywhere from three to seven years! If you plead guilty or nolo contendere to your speeding ticket, it can cost you hundred or even thousands of dollars in future car insurance costs. Atlanta Speeding Ticket Attorney Sean Goldstein will try to save you money in the long run by getting your speeding citation either reduced or dismissed. If we can get your speeding ticket reduced or dismissed, the violation will not be reported to your driving record. Since the speeding ticket is not reported to your driving record, the car insurance company never finds out about it and your car insurance rates do not increase. Often, the fee to hire a speeding ticket lawyer is less than the future car insurance costs if you are found guilty of speeding or plead nolo contendere to speeding. Most drivers who attempt to figure out the confusing world of Georgia traffic law encounter aggravation when they attempt to handle their speeding tickets on their own. Not only is Georgia traffic law confusing, but each municipal and county traffic court in the Atlanta metro area have different procedures for speeding tickets. Save yourself the frustration. Don’t try to beat your speeding ticket yourself. 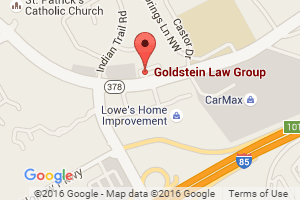 Call speeding ticket attorney Sean Goldstein today and save yourself the headache. Note: Drivers under 21 years of age at the time of conviction will have their licenses suspended for speeding 24 miles an hour or greater. Georgia Super Speeder laws apply when speeding in excess of 75 mph on a two lane road or 85 mph on any road or highway. An additional $200.00 fine is imposed in Super Speeder cases, with nonpayment of the fine resulting in license suspension. Even if you are an out-of-state driver, you are still subject to the Super Speeder penalties. If you’ve gotten a speeding ticket in Atlanta, or anywhere in the State of Georgia including Gwinnett County, Dekalb County, Fulton County, Cobb County, or Douglas County, or in the cities of Atlanta, Alpharetta, Brookhaven, Chamblee, Doraville, Douglasville, Dunwoody, Duluth, Johns Creek, Lawrenceville, Marietta, Norcross, Roswell, Sandy Springs, or Suwanee, call us at (678) 757-5529 for a free consultation or Contact Goldstein Law Group online.